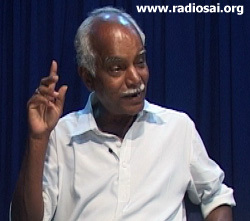 We continue with our presentation of the wonderful recollections of Mr. Chidambaram Krishnan, a long-time devotee of Bhagavan Baba who came to the Lord under somewhat unusual circumstances. In the last installment we broke off at a point where Swami had taken a group to the beach in Quilon, Kerala, and wanted to know whether there were any refreshments they could partake of. There were none, and the nearest shop was four kilometres from the beach. It was clearly not possible to trek that distance and buy snacks; that would take too much time. On the other hand, Swami could see that everyone was hungry. So what was to be done? Devotees did the only thing they could – look to Bhagavan. And what did Swami do? To find out, read on. 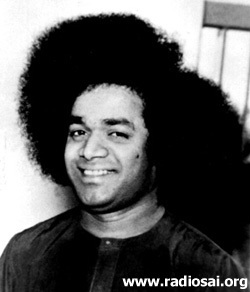 Just then, Swami’s glance fell on a plate that had been brought for use while offering Aarathi. He said, “Give Me that plate.” The plate was given. He covered the plate with His handkerchief and then removed it. Lo and behold, the plate was full of hot Mysore paks (sweets), and they tasted delicious – so sweet! 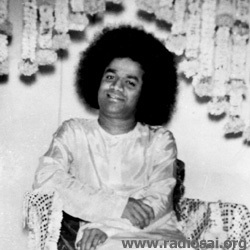 Swami distributed the sweets and when all of them were given out, He again covered the plate with His handkerchief. When He removed it, this time there were hot, crisp, karaboondhi, a tasty savoury. Those too were distributed, much to the delight of everyone present. Swami then said, “What about coffee?” Of course, there was no coffee. In those days, whenever Swami went out, He would carry two flasks full of hot water, some Nescafe packets, and a tin of Nestle’s milk powder. When the time came, Swami Himself would mix the coffee and serve it to all. This time, the arrangements were made by the Governor’s establishment, which had not made any allowance for the sudden changes of plans that Swami is famous for. Swami then asked, “Have any of you got a flask?” I had a flask and someone else had a flask too. We gave both these flasks to Swami, who gently tapped on the side.He then opened the flasks and they were full of steaming coffee, smelling so good. That is how Swami gave us divine tiffin and divine coffee on the beach that evening. On that occasion, Swami produced coffee with gentle taps. I am reminded of another occasion which occurred around 1961-1962, when gentle divine taps produced petrol instead of coffee. Let me digress and narrate that incident. It so happened I was once driving Swami to Madras (now Chennai) from Puttaparthi. In those days, whenever Swami wanted to make a long distance trip by car, He would send me advanced information. There were standard instructions: “Fill the tank with petrol and also carry some extra petrol in a few cans.” I have driven Swami to many places like Hyderabad, Madras and so forth. On this occasion there was no advanced intimation sent to me before I left for Puttaparthi, so I did not bother about a full tank, etc. I had come prepared for a long stay of several months and told myself that when I returned I would fill the tank in Penukonda. Swami got into the car and I started driving. The moment we left, Swami started ticking me off. He said, “You have made a big mistake. You should have filled the tank earlier. Don’t you know that in life there could be a sudden change of plans? You must know how to anticipate. Events will not always happen with earlier announcements,” and so on. A non-stop barrage of criticism! With all these complaints I was of course feeling very uncomfortable. And all the time I was dreading that something very unpleasant was going to happen. The Petrol Stations are Dry! To get on with the story, we reached Penukonda but the bunk there had no petrol. We drove on and reached Bagepalli; no luck there. With great trepidation, I then drove on to Chickballapur, and to my great horror, both the bunks there were dry! In those days traffic was quite light and bunks filled up only once in a while. I must also tell you that access to Puttaparthi was very difficult in those days. If you came by car you can be certain that during the trip at least three or four parts would get damaged. On the way we had to cross about twenty or so small streams; there were no bridges or even causeways. Often these streams were dry and there would be big stones scattered all over the place. If one was not very careful, one of these stones might strike the under chassis, leaving the traveller stranded midstream. During the rainy season there could be dangerous flash floods that could wash away the vehicles. In a very good car we could drive from Bangalore to Puttaparthi in about six hours. If the car was old, it was a full day’s journey. For coming from Madras to Puttaparthi, one could take one of three routes. One of these was via Penukonda but this was not often favoured because of a big stream one had to cross. There was another route via Gorantla, but this route was littered with big boulders that made driving very difficult. The third road was via Muddi Gubba and that was the route I often took. In the 60s, one could drive to Puttaparthi, but prior to that, in the 40s and 50s, one could only go up to Karnatakanagepalli, opposite Puttaparthi on the other side of the Chitravathi River. 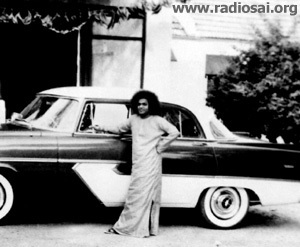 In those days Swami had a green Dodge car. That car would then be towed by bullock cart across the river from Karnatakanagepalli to Puttaparthi. Those were truly difficult days. You know what Swami went through to build the Mandir here? Today, we all sit comfortably in the Mandir and sing Bhajans. Swami could have instantly created the Mandir using His Divine powers but He did not want to do it that way. In every Mission of His, Swami has struggled and toiled exactly as we would if we had undertaken that job. This was His way of setting an example in determination and tenacity. He never ever used His Divine powers that would have made things so very simple. Do you know what a hassle it was to bring those huge steel girders to the Mandir site? Once during construction, Swami was up above giving instructions when He slipped and fell. This incident is not recorded in any book, but it is a fact that Swami fell and suffered an injury on the head. Swami immediately commanded, “Take Me to My room,” and that was done. Swami then asked everyone to leave the room and close the door. Half an hour later, Swami opened the door and came out. There was no trace of any injury except a scar that looked six-months old. Let me get back to the petrol story. As I said earlier, in Chickballapur we also drew a blank – no petrol in the two bunks there. Swami then asked, “What route are you going to take? 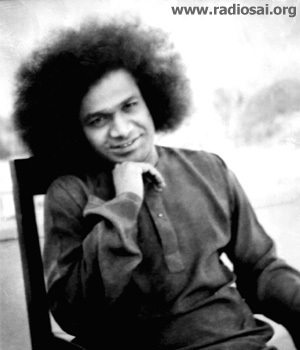 And how long do you think you can manage with the petrol you have?” I replied, “Swami, I think with careful managing we may be able to reach Kolar, where we can surely fill the tank.” Swami pondered that for a minute and then said, “You think so? In that case, go ahead but make sure you do not leave Me stranded in the middle of the road.” I said OK but then I was under such stress that I took a wrong turn and entered the road leading to Chintamani instead of to Kolar. I did not realize this when I made the turn. It was only after driving for sometime that I saw a milestone that showed the distance to Chintamani. My head started spinning. Here I was on the wrong road and there was no bunk in Chintamani. How do I break this bad news to Swami? Soon the car would come to a halt and then I would get it from Swami left and right. "Maybe You Did Not Read The Gauge Properly"
I obeyed and got into the car and turned on the switch. I saw the meter and it showed the tank was full. I was puzzled and said, “Swami, I think something is wrong with this meter.” Swami rejected my analysis and said, “How can that be? This is a new car. I think the meter is right. You just turn the key and see what happens.” I did that, and wonder of wonders, the car started! Meanwhile, Swami started laughing, and that was when I realized that by tapping the tank from the outside, in a flash He had actually filled the tank. Swami then said, “Let this not happen again. Always be prepared and be ready for all eventualities.” Back in Quilon, Divine taps produced coffee and now they produced petrol. I digressed somewhat mainly to narrate this incident.